From the parking area there is an unmarked trail leading steeply into the woods. Follow the unmarked trail over eroded terrain for 0.13 miles to N43 32.191, W71 07.059 and the junction of the Blue Trail. 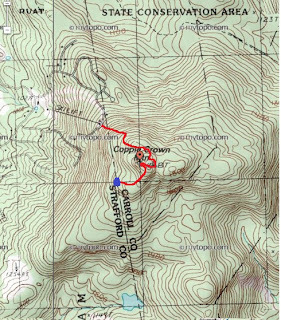 Continue 0.17 miles along the blue trail to the saddle between Copple Crown and it's Eastern peak. Turn right and continue for 0.1 miles to the unmarked Copple Crown summit and nearby overlook. There are no benchmarks or markings other than the highest point to mark the actual summit. I descended the summit proper looking for the Strafford County High Point on the Southwestern slope. From the summit I began a Southwest bushwhack and found a herd path at N43 32.022, W71 06.932. I followed the herd path through the upper elevation thicker and leafier hardwoods into taller spruce trees. The bushwhacking was easy through the spruce and after a minimal search found the Copple Crown High Point marked with 2 flagging strips on a spruce tree at N43 32.000, W71 07.071. Return the way you came. Unmarked Trail - Blue Blazed Trail = 0.13 Mi. Blue Blazed Trail - Trail Junction = 0.17 Mi. 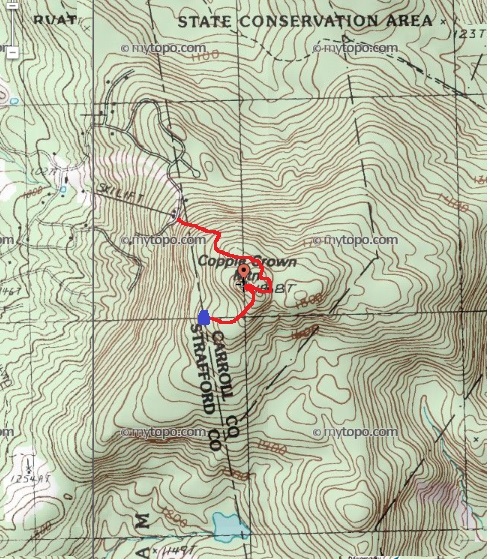 Trail Junction - Copple Crown Summit = 0.10 Mi. Copple Crown Summit - Copple Crown Southwest slope Highpoint = 0.15 Mi. Unmarked Trail - Copple Crown Summit = 15 Minutes. NOTES / COMMENTS: The trail from parking is unmaintained, steep, filled with boulders and eroded in places. Once you merge with the blue trail the incline becomes much more gradual and the hike is enjoyable through moss covered rocks (shown below). The blue trail reaches the saddle between the summit of Copple Crown and Copple Crown East where a sign marks the trail junction between the two peaks. The tree below were the only markings near the Copple Crown Southwest slope high point.